Op deze link vind je de Nederlandstalige spelregels van Caylus. Once upon a time ... 1289. To strengthen the borders of the Kingdom of France, King Philip the Fair decided to have a new castle built. For the time being, Caylus is but a humble village, but soon, workers and craftsmen will be flocking by the cartload, attracted by the great prospects. Around the building site, a city is slowly rising up. The players embody master builders. By building the King's castle and developing the city around it, they earn prestige points and gain the King's favor. When the castle is finished, the player who has earned the most prestige wins the game. 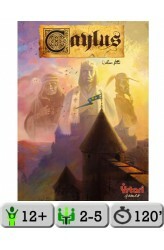 The expansion Caylus Expansion: The Jeweller was included in the 2nd Edition. Each turn, players pay to place their workers in various buildings .. 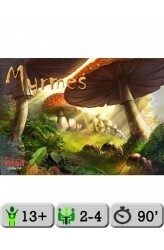 In Myrmes, originally shown under the name ANTerpryse, players control ant colonies and use their ants to explore the land (leaving pheromones in their wake); harvest "crops" like stone, earth and aphids; fight with other ants; complete requests from the Queen; birth new ants; and otherwise dominate their tiny patch of dirt, all in a quest to score points and prove that they belong at the top of the heap, er, anthill. After three seasons of scrabbling and foraging, each ant colony faces a harsh winter that will test its colonial strength. In game terms, each player has an individual game board to track what's going on inside his colony – that is, whether the nurses are tending to larvae or doing other things, where the larvae are in their growth process, what resources the colony has, w.. The theaters of London are abuzz. In one week, her majesty the Queen will attend their new shows and will grant her support to one of the troupes. It's the chance of a lifetime for the young authors who are inflaming the populace with ever more audacious and motley plays. But how do you create a masterpiece in such a short time? Whoever has the answer to this thorny question will probably enter the rolls of history! In Shakespeare, players are theater managers who must recruit actors, craftsmen, jewelers and others in order to assemble everything needed for the play's performance at week's end. 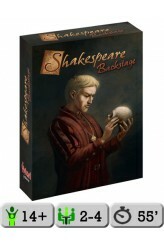 In more detail, the game lasts six days and on each day players recruit one new character — starting with five at the beginning of the game: four identical ones on their individual player..
You can find everything you need in the backstage: Lord Chamberlain to get additional stunning actors, a prompter for those who forget their lines, a milliner for a costume with a panache, an architect to redesign the frontage of your theater... 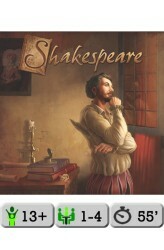 Prepare for success and a new theater season with Shakespeare: Backstage, the first expansion for Shakespeare! New actors, new objectives, new costumes, and an innovative stage set allow you to shine when the curtain rises and all the lights are on you. Backstage cards allow players to utilize unwagered cylinders by placing them on the deck and spending them on special abilities, such as placing fewer rest tokens, adding hats to actors, or increasing ambiance. ..
Have you ever had the desire to walk the streets of Victorian London with Sherlock Holmes in search of Professor Moriarty? To search the docks for the giant rat of Sumatra? To walk up Baker Street as the fog is rolling in and hear Holmes cry out, "Come, Watson, come! The game is afoot!"? Now you can! You can enter the opium den beneath the Bar of Gold, but beware, that may be Colonel Sebastian Moran lurking around the corner. 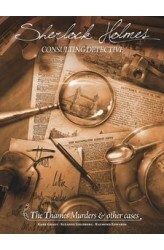 You can capture the mystery and excitement of Holmes' London in this challenging and informative game. You, the player, will match your deductive abilities against your opponents and the master sleuth himself, Sherlock Holmes. In Sherlock Holmes Consulting Detective, you are presented with a mystery to solve, and it is then up to you to trace the threads of evi..